"Pole bean" redirects here. For other uses, see Beanpole. 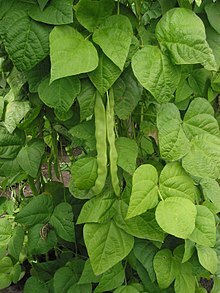 Phaseolus vulgaris, also known as the common bean, green bean and French bean, among other names,[n 1] is a herbaceous annual plant grown worldwide for its edible dry seeds or unripe fruit (both commonly called beans). The main categories of common beans, on the basis of use, are dry beans (seeds harvested at complete maturity), snap beans (tender pods with reduced fibre harvested before the seed development phase) and shell (shelled) beans (seeds harvested at physiological maturity). Its leaf is also occasionally used as a vegetable and the straw as fodder. Its botanical classification, along with other Phaseolus species, is as a member of the legume family Fabaceae, most of whose members acquire the nitrogen they require through an association with rhizobia, a species of nitrogen-fixing bacteria. The common bean is a highly variable species that has a long history of cultivation. All wild members of the species have a climbing habit, but many cultivars are classified either as bush beans or dwarf beans, or as pole beans or climbing beans, depending on their style of growth. These include the kidney bean, the navy bean, the pinto bean, and the wax bean. The other major types of commercially grown bean are the runner bean (Phaseolus coccineus) and the broad bean (Vicia faba). Beans are grown on every continent except Antarctica. Worldwide, 27 million tonnes of dried beans and 24 million tonnes of green beans were grown in 2016. In 2016, Myanmar was the largest producer of dried beans, while China produced 69% of the world total of green beans. The three commonly known types of green beans are: string or snap beans, which may be round or have a flat pod; stringless or French beans, which lack a tough, fibrous "string" running along the length of the pod; and runner beans, which belong to a separate species, Phaseolus coccineus. Green beans may have a purple rather than green pod, which changes to green when cooked. Wax beans are P. vulgaris beans that have a yellow or white pod. Wax bean cultivars are commonly grown; the plants are often of the bush or dwarf form. Many well-known bean cultivars and varieties belong to this species, and the list below is in no way exhaustive. Both bush and running (pole) cultivars/varieties exist. The colors and shapes of pods and seeds vary over a wide range. Appaloosa Front portion of the bean is ivory colored; the other end is speckled with purple and mocha. The bean is named after the Appaloosa ponies of the Nez Perce tribe. The seed was cultivated near the Palouse River in Eastern Washington and Northern Idaho. Calypso beans are half black, half white, with one or two black dots in the white area. When young, the pods can be harvested as a green bean. But when full-grown, they are used as a bean for drying. Dragon tongue bean is young green bean of cranberry bean, pinto bean. It is a flavorful, juicy bean whose seeds are encased in a buffed colorful pod with mottled burgundy patterns throughout the shell's surface. The shelled beans are pale pistachio green in color, their size, petite, and their shape, ovate and slightly curved. Flageolet beans are often eaten in France. The seeds are small, light green, and kidney-shaped. The texture is firm yet creamy if shelled and cooked when fresh but semidry. Kidney beans, also known as red beans, are named for their visual resemblance in shape and color to kidneys. They are sometimes used in chili con carne, and are an integral part of the cuisine in northern regions of India. They are also used in New Orleans and much of southern Louisiana for the Monday Creole dish of red beans and rice as well as the Caribbean habichuelas guisadas and Central American gallo pinto. A type of P. vulgaris called pea bean has been recorded in Britain since the 16th century. In the US, the name "pea bean" is also used to describe small white beans, and the same name is used for Vigna unguiculata subsp. sesquipedalis, also called yard-long bean and cowpea. The seeds of the British pea bean are bicolored red-brown and white. 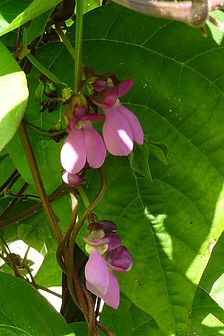 The plants are a typical climbing bean. The beans are either eaten in the pod like French beans or they may be harvested when mature and eaten as other dried beans. Pink Pink beans are small, pale pink, oval-shaped beans also known by the Spanish name habichuelas rosadas. The Santa Maria pinquito (Spanglish = pink and small), is commercially grown on the mesas above Santa Maria, California, and is a necessary ingredient in Santa Maria-style barbecue. Rattlesnake A medium-sized, oblong bean with light brown seeds striped with brown markings. Named for the snake-like manner in which their pods coil around the vine. Navy beans or haricot beans are particularly popular in the United Kingdom and the United States. Other white beans include cannellini, a popular variety in central and southern Italy that is related to the kidney bean. White beans are the most abundant plant-based source of phosphatidylserine known. Yellow 'Sinaloa Azufrado', 'Sulphur', 'Mayocoba', and 'Peruano' (also called canary) are types of yellow beans. Peruano beans are small, oval, yellow beans about 1/2 in (1 cm) long with a thin skin. They have a creamy texture when cooked. Despite the name ('Peruvian beans' in Spanish), they are native to Mexico. 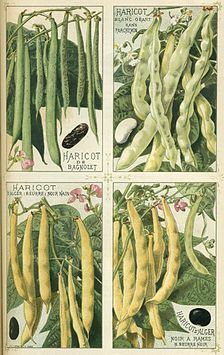 Yellow beans are uncommon in the United States due to a controversial patent issued in 1999 to John Proctor, who selected and named a strain of yellow bean from seeds he brought back from Mexico. U.S. Patent No. 5,894,079 (the Enola or yellow bean patent) granted POD-NERS, LLC., exclusive right to import and sell yellow beans in the United States from 1999 through 2008, when the patent was rejected after reexamination. Tongue of Fire Tongue of Fire (also known as Horto) has ivory white pods with red streaks that look like flames. The bean stalks grow close together, require plenty of sun and form large roundish pods. Original seed was reportedly from Tierra del Fuego on the tip of South America, sent to Italy and spread through southern Europe. In 2016, world production of green beans was 23.6 million tonnes, led by China with 79% of the total (table). World dried bean production in 2016 was 26.8 million tonnes, with Myanmar, India, and Brazil as leading producers (table). Look up presoak in Wiktionary, the free dictionary. ^ Also known as the field bean, flageolet bean, garden bean, green bean, haricot bean, pop bean, snap, snap bean, or string bean. ^ Gentry, Howard Scott (1969). "Origin of the Common Bean, Phaseolus vulgaris". Economic Botany. New York: New York Botanical Garden Press. 23 (1): 55–69. doi:10.1007/BF02862972. JSTOR 4253014. ^ a b "Phaseolus vulgaris". Germplasm Resources Information Network (GRIN). Agricultural Research Service (ARS), United States Department of Agriculture (USDA). Retrieved September 22, 2013. ^ a b c d Phillips, R.; Rix, M. (1993). Vegetables. New York: Random House. ISBN 9780679750246. ^ a b c "Green bean production in 2016, Crops/Regions/World list/Production Quantity (pick lists)". UN Food and Agriculture Organization, Corporate Statistical Database (FAOSTAT). 2017. Retrieved 27 September 2018. ^ Paul Gepts (December 1998). "Origin and evolution of common bean: past events and recent trends". HortScience. 33 (7): 1124–1130. doi:10.21273/HORTSCI.33.7.1124. ^ Rombauer, Irma S. The Joy of Cooking. Scribner, ISBN 0-684-81870-1, p. 271. ^ Press, L. (2002). The Bean Book: Over Seventy Incredible Recipes. Globe Pequot Press. ISBN 9781585744732. ^ Nadeem, Muhammad Azhar; Habyarimana, Ephrem; Çiftçi, Vahdettin; Nawaz, Muhammad Amjad; Karaköy, Tolga; Comertpay, Gonul; Shahid, Muhammad Qasim; Hatipoğlu, Rüştü; Yeken, Mehmet Zahit; Ali, Fawad; Ercişli, Sezai; Chung, Gyuhwa; Baloch, Faheem Shehzad (2018-10-11). "Characterization of genetic diversity in Turkish common bean gene pool using phenotypic and whole-genome DArTseq-generated silicoDArT marker information". PLOS ONE. 13 (10): –0205363. doi:10.1371/journal.pone.0205363. ISSN 1932-6203. ^ "Vigna unguiculata subsp. sesquipedalis". Germplasm Resources Information Network (GRIN). Agricultural Research Service (ARS), United States Department of Agriculture (USDA). Retrieved September 22, 2013. ^ "Pink Bean – Definition and Cooking Information". RecipeTips.com. Retrieved 2012-01-14. ^ Ron Herbst; Sharon Tyler Herbst (2015). The Deluxe Food Lover's Companion, 2nd edition. Barron's Educational Series. pp. 1439–. ISBN 978-1-4380-7621-8. ^ "Maize 2003 CGC Meeting". Ars-grin.gov. Archived from the original on 2012-09-15. Retrieved 2012-01-14. ^ Souci SW, Fachmann E, Kraut H (2008). Food Composition and Nutrition Tables. Medpharm Scientific Publishers Stuttgart. ^ "The Enola Bean Patent Controversy: Biopiracy, Novelty And Fish-And-Chips". Law.duke.edu. Retrieved 2012-01-14. ^ "Appeal 2007-3938" (PDF). Retrieved 2012-01-14. ^ "A sampling of bean cultivars". The University of Melbourne. Retrieved 2008-01-30. ^ a b c d e "Bad Bug Book: Handbook of Foodborne Pathogenic Microorganisms and Natural Toxins: Phytohaemagglutinin" (PDF). United States Food and Drug Administration. Retrieved 2014-01-07. ^ Bad Bug Book SE (2017). "Foodborne Pathogenic Microorganisms and Natural Toxins Handbook Phytohaemagglutinin". US Food and Drug Administration. Retrieved 23 August 2017. ^ a b Szyndler, M.W. ; Haynes, K.F. ; Potter, M.F. ; Corn, R.M. ; Loudon, C. (2013). "Entrapment of bed bugs by leaf trichomes inspires microfabrication of biomimetic surfaces" (PDF). Journal of the Royal Society Interface. 10 (83): 20130174. doi:10.1098/rsif.2013.0174. ISSN 1742-5662. PMC 3645427. Wikimedia Commons has media related to Phaseolus vulgaris.